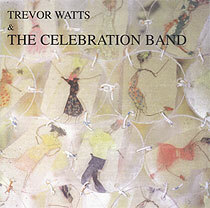 Trevor Watts, alto and soprano saxophone, dkarabouka, moroccan tabla, cabassa, piano, keyboards, composer, arranger; Rob Leake, tenor and soprano saxophones; Amy Metcalf, tenor saxophone; Marcus Cummins, alto and soprano saxophones; Geoff Sapsford, guitar; Jamie Harris, djembe, djarabouka, indonesian drum; Roger Carey, bass guitar; Giampaolo Scatozza, drums. Recorded at ARC Studios, Hastings in April 2001. Front cover design (reproduced above) by Anna Watts.